Although Vision recently suspended racing operations, their not giving up on the 2010 season. The team that has continually set the bar higher and higher in terms of social media and fan participation is calling on the fans for their support. 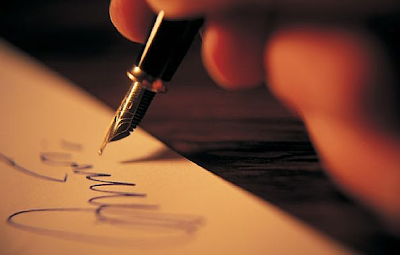 If you feel so inclined, write up a letter. It doesn't have to be much, just a short paragraph or two explaining your love for the sport, and your support of Vision Racing and their sponsors. Vision will then forward the letters to potential backers and include them in sponsors presentations. You can find out more info on the campaign here. For the 2nd consecutive year the good folks over at The Furious Wedge are hosting a 24 hours of Daytona blogathon. But this year a number of other IndyCar bloggers have joined in on the fun including, The Silent Pagoda, Speedgeek, MyNameIsIRL, Pressdog, IsItMayYet, Too Much Racing, Oilpressure, Planet-IRL, Pop Of Valve and yours truly. For the next 24 hours we'll all be posting on everything sports related, ranging from the race to pick up sticks and everything in between. Although I won't be posting much, mostly due to the facts that I can't write funny and even if I could, I despise writing anyway, I'm sure the next 24 hours will be incredibly interesting/disturbing/hilarious. According to the Indy Star's Curt Cavin, the Indy Racing League has signed on Randy Bernard to take over as their new CEO. Bernard who was the CEO of the Professional Bull Riders (PBR) since 1995 takes over for Tony George who resigned the position in June. VT: How has the economic downturn affected ticket sales? Randy Bernard: This year, right now we are up 13.2 percent but our average ticket is down $2.56 a ticket. VT: What revenue streams are the strongest? Randy Bernard: We’re down about 14 percent right now on our merchandise but like I said we’re up 13 and a half percent on our gate. The thing that we have been very happy about is that our web traffic is up 8 percent on the year. With sponsorships, we’re holding our own. We just signed a brand new sponsor this week, Dish T.V. and that is a big one. Randy Bernard joined Professional Bull Riders, Inc. as CEO in August of 1995. As CEO, Bernard shared the vision of the founding members of the organization, twenty one bull riders that broke away from rodeo to revolutionize bull riding and establish it as a stand alone sport. Bernard worked in tandem with the founding members to develop and guide the PBR brand, and the sport itself, through several stages of growth. In a short twelve years under Bernard’s leadership, the PBR has become one of the fastest growing sports properties in North America, providing opportunities to bull riders that only existed in the imagination of the founding members. In April 2007, Bernard successfully executed a merger between Professional Bull Riders, Inc. and Spire Capital Partners, a New York based private equity firm. The merger allowed the founding members and other bull riding shareholders to capitalize on their vision, dedication and commitment while maintaining a significant equity stake in the organization. Bernard remains CEO of PBR under the new ownership structure. Bernard attended Cal Poly San Luis Obispo and spent six years in the marketing and entertainment department of the California Mid State Fair prior to joining the PBR. Bernard has three children, Priscilla, Ryan and Alexandria, and is married to Cameo Kneuer, a fitness expert and television personality. Randy splits time between his home in Pueblo, Colorado and his home in Los Angeles, California when not traveling on PBR business. Dreyer and Reinbold Racing will announce their 2010 driver plans on Tuesday (2) morning at 11. It's still unclear as to the number of pilots, but I am expecting a two car lineup. Just a couple weeks after their first test, FAZZT Race Team has signed on Maryeve Dufault as a developmental driver for 2010. 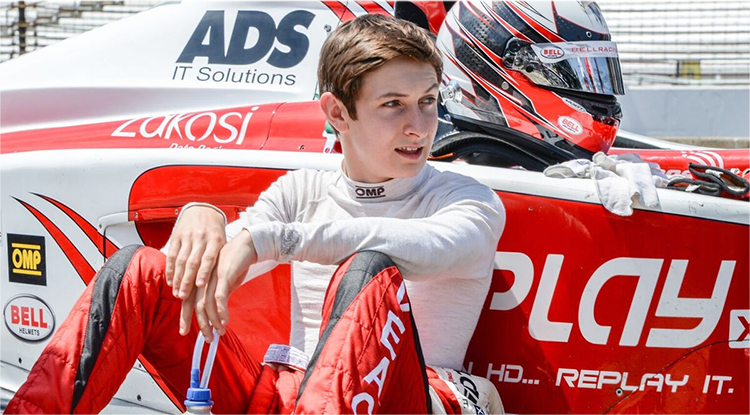 Dufault, a Quebec native has past experience in Karting, Formula Jim Russell, Skip Barber, Formula BMW, Star Mazda, and testing for Formula 3 in England. FAZZT will assist in sponsorship and will field Maryeve in IndyCar's developmental ladder system and in Nascar Canadian Tire Series events with Alex Tagliani's team. "Two of the long straightaways have relatively slow corners leading onto them. There are some good 90-degree turns at the end of the straights, and on one occasion a little tighter than that. It's a track that's challenging but can create some exciting racing and will provide a challenge for the teams deciding on their downforce levels for both qualifying and the race. Less downforce generally means less grip. Combine that with the longest straightaway of any track in the IZOD IndyCar Series and overtaking should be exciting. It should be a spectacular sight for the fans at Turn 11 watching the cars braking from about 185 mph to 50 mph as they enter the Sambodromo. Running through the middle of the stadium that hosts Carnival, which holds about 30,000 people, I think will be an electric atmosphere for the drivers. That portion of the track through the stadium is concrete and everywhere else will be asphalt, so there will be some surface changes. That's always good for the racing. From the grandstand perspective, how could you have run around it or not use it?" With long straightaways, it's certainly going to be fast and you definitely will have challenges. No question it will be a good race and the people are so excited to have Formula Indy come to Brazil." In the latest addition of Curt Cavin's weekly Pit Pass article in the Indianapolis Star, he reports that Davey Hamilton will run at least 3 races in 2010 with sponsor Hewlett Packard. According to Cavin, Hamilton will run at Indianapolis, Texas, and at least one other race. Be sure to check out the article where Curt also unveils several possibilities for the new CEO of the Indy Racing League. Just months after stepping down as IMS CEO Tony George has submitted his resignation to the Hulman and Company board of directors. According to the release "His resignation removes George from any remaining role in Hulman & Company, Indianapolis Motor Speedway, Indy Racing League, IMS Productions and other affiliated companies." According to the release, Tony will still own and operate Vision Racing. "As members of his family, we are sorry to see Tony leave. We are grateful for his service to our company as a board member and of course for formerly serving as CEO and president of our companies. I speak for our whole family in wishing him well. All of us had hoped that Tony would continue to serve on the board, and we made that clear to him. We are disappointed with his decision to step down despite our wishes. Unveiled via twitpic by Ryan, here is the livery for the #37 IZOD entry, but apparently the design isn't completely finished, so stay tuned. Be sure to check out last weeks interview with Ryan where he discloses at least part of his 2010 schedule, discuses the advantages of a 4 car team, gives his thoughts on the 2012 chassis, and much more. Last week a poll was posted for fans to vote for their top 10 American Open-Wheel drivers of the decade, and now the results are in. With over 2,000 votes, it was an incredibly close battle, particularly for the top 3 or 4 spots. This week I joined Paul and Kohl on the Planet-IRL podcast to reveal places 6-10. Next week we'll unveil spots 1-5, and hopefully (fingers crossed) the driver of the decade, as voted on by the fans will be able to join us. Looking back over the past decade in the IZOD Indy Car Series, many images stick out in our minds. Many things have changed this decade since the green flag fell in 2000 at Walt Disney World Speedway. I have selected the ten images that I feel stick out the most over the past decade, from tears in the winner circle, to scary accidents and controversial finishes! 10. Streets of St. Pete- In 2005, the IZOD Indy Car Series made a huge change. The addition of road and street courses would start a new excited era of racing for the series. The first time drivers had to turn right and left was at St. Pete in 2005. Dan Wheldon took the checkers forever cementing his name in the record books as the first driver to win a non oval Indy Car race. Currently the 2010 schedule has nine street or road courses on it. 9. 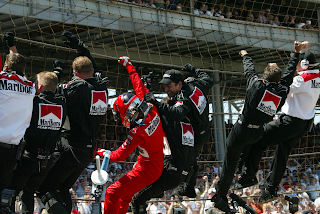 Dancing For Rain- The 2007 Indy 500 was wet and wild. Threatening skies hung over the Indianapolis Motor Speedway most of the day, but the 500 went green right on schedule. After 113 laps, the red flag flew due to heavy showers. Tony Kanaan was in the lead, and as the rain become to come down heavily, was in perfect position to win his first 500, and the race was official after the 101st lap. After the rains let up, and the track was dry, the drivers were called back to their cars, and the soaked fans headed back to the stands around 6:15. On lap 163, with rain clouds vastly approaching, Marco Andretti tangled with Dan Wheldon, sending Marcos car airborne and upside down. Many cars where involved and cars were scattered all over the back stretch. Before the carnage was clear, the rains came on lap 166 giving Dario Franchitti the victory. He drove carefully around the rain soaked speedway as wife Ashley Judd celebrated by dancing in the rain on the front stretch. 8. Fuming Finish. The 2007 championship battle came right down to the final lap at Chicagoland. Franchitti, the 500 champion that season, had a crazy season. He found himself upside a few times, and only had a three point lead entering the final race. On the final restart of the race on lap 198 of 200, Dixon lead Franchitti both with very low fuel tanks. They took the white flag side by side and set up for an amazing finish. 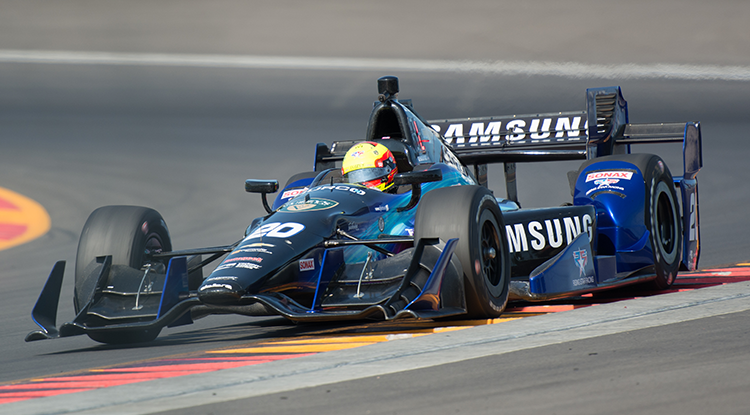 As turn three approached, Dixon peeled to the bottom of the track and Franchitti sped by to take the victory and the championship. Dixon was a gallon of fuel short. Franchitti won the title by 13 points and Dixon finished 2nd coasting on fumes to the finish. 7. Paul's Pass. The 2002 Indianapolis was one of the most competitive of the decade, and it came down to controversy at the end. Heading down the backstretch on lap 198, Tracy ran the high line and completed the pass to take the lead from Helio Castroneves. As the pass was being made, Laurent Redon and Buddy Lazier wrecked in turn 2. The yellow came out, and was later determined the yellow light was on before Tracy could complete the pass. Helio went on to win his second straight 500, as Paul Tracy and Team Green protested the finish. On July 2nd, Paul's Pass was confirmed as being completed after the yellow light was on, and Helio would keep the 500 victory. 6. Champions Climb- For the first time at the Indianapolis 500, the winner did not drive his car straight to victory circle. Instead, rookie winner Helio Castroneves stopped just short of the yard of bricks, climbed from the cockpit, and climb the front stretch catch fence. The entire Team Penske crew joined Helio, and the nickname "Spider Man" was born for Helio. In 2002, Helio again made the Champions climb, becoming the first back to back 500 winner since 1970 and 1971 winner Al Unser Sr. Helio, after being warned by Indy Car officials, climb the fence for the third time in 2009. 5. Patrick's Push- In 2005, Rookie Danica Patrick took the Indianapolis 500 by storm. busted on the scene, being put into one of the best cars on the best team for Rahal Letterman Racing. Danica qualified fourth, becoming the fastest women at the Speedway in history. On lap 155, during a restart, Danica made her only rookie mistake of the month. She spun the back tires in the short chute and did a half spin, causing a chain reaction wreck behind her. Five cars spun and made contact, knocking them out of contention. Danica remained focused, got a new front nose cone, and on lap 190, during a restart Danica shot around leader Dan Wheldon and took the lead. Everyone stood on their feet, as the reality of a women winning Indy became clearer and clearer. As he fuel tank ran down, Patrick's push to win the 500 ran down with it. Wheldon took the lead and the win, as Danica fell to finish fourth, the best by a women at the Indianapolis 500. 4. Date with Disaster- Going around a track at 225 mph, inches apart can lead to some horrifying incidents. Every driver fears it, and has been involved in some kind of hard hit along the way in their racing careers. Ryan Briscoe had the scariest wreck of the decade. In the 2005 race at Chicagoland, Briscoe, running for Chip Ganassi at the time, made contact with Ed Carpenter send his #33 Target car straight into the catch fence. His car split in half and caught fire on impact. Fortunately for Briscoe, he broke both clavicles and earned the nickname " Briscoe Inferno." Dario Franchitti, in his championship 2007 season, saw his ups and down throughout the season. At the Firestone Indy 400 and Michigan International Speedway, Franchitti was battling for the lead on lap 143 when he made contact with Dan Wheldon down the back stretch. Dario's #27 car turn straight left, then up into the air. His car was straight up and down in mid air, and landed upside down before being hit and flipped by Scott Dixons car. Franchitti's car slip to a stop, and track workers, with help from fellow driver Sam Hornish Jr. who was also caught in the crash, flipped the car upright and Dario Climbed out. Briscoe and Franchitti both survived their date with disaster. 3. Tear's of Joy- In 2008, history was made at Twin Ring Motegi. Danica Patrick became the first women to win an Indy Car Race. With just three laps to go, Helio Castroneves ran out of fuel and Danica took the lead and the victory. Those were the only three laps she lead that day, and the fuel gamble paid off for her and her Andretti Autosport team. Tear's of joy ran down her face during the post race interview and as she was handed the winning trophy. She qualified sixth for the race and broke into the winner's circle for the first and only time in her career. 2. Hornish Got 'Em- In 2006, Marco Andretti was nineteen years old, making his first Indianapolis 500 start. It was his first start, and his father, Michael's final bid to win his first Indy 500. On the final restart of the race at lap 195, Michael lead son Marco to the line for the green flag restart. Marco, with the faster car, passed his father for the lead heading into turn one. Sam Hornish Jr. was charging hard in the third spot. Michael, trying to secure the win for his son, blocked Hornish as much as he could, but it wasn't enough. Hornish raced around Michael and was heading for a pass on Marco into turn three on lap 198 when Marco ran him down to the white line. Hornish had to lift and fell back. Marco took the white flag well ahead of Hornish. Hornish gained all the way down the back stretch of the last lap and coming out of turn four, Hornish got a tow and passed Marco right before the yard of bricks to take the win in the second closest 500 finish in history. 1. The closest finish in history- on September 8th, 2002 Sam Hornish Jr. beat Al Unser Jr in the closest finish in Indy Car history. The margin of victory was .0024. Chicagoland Speedway has played host to many of the closest finishes in history including the closest 1-2-3 finish, also won by Sam Hornish Jr. The top 6 were side by side two deep for the final laps. Hornish on the high side, Unser Jr. on the bottom battled to the stripe. Hornish, fist in the air, edge Unser at the finish! As you may have noticed from yesterday's FAZZT Race Team unveiling, 2010 will bring a few changes to the IZOD IndyCar Series' liveries. According to IndyCar PR "The placement of the IZOD IndyCar Series and Honda logo on the FAZZT car illustrates how it will be on all cars this season"
So, with the addition of IZOD as the title sponsor, the series logo will replace the Honda logo. You may have also noticed a difference in the logos shown on the car, and the one that you have come to know over the last couple months. What you see on the car is the alternate "stacked" layout. That version, which is more square, is to be used when horizontal space is limited. The Honda logo will then be moved down and back, finding it's self near the middle of the cowling. Just days after their inaugural test at Homestead-Miami, FAZZT Race Team unveiled their Brazil sponsorship package and livery today at the Montreal Auto Show. After a very successful 2009 Indianapolis 500 finishing 4th for KV Racing, Townsend Bell has signed on to pilot the #99 Sam Schmidt Motorsports/Chip Ganassi Racing Dallara in the 94th Indianapolis 500. 16th And Georgetown: Andretti Autosport is obviously one of the top 3 or 4 teams in IndyCar, even with their struggles of 2009. You should be competitive at the very least, if not a contender at pretty much every track you go to in 2010. After a pretty turbulent 09 season, what are some of your goals and expectations for this year? Ryan Hunter-Reay: Well first, to join a team of Andretti Autosport's caliber is something that I've been working towards my entire career and to finally be there is quite an honor. It's a time in my motorsports career that it's pretty special and I'm really looking forward to working with everybody there. The goals right now are constantly moving just because were trying to put together a full-season, we have anywhere between 5 to 7 races confirmed right now. This team and the folks they have putting together these sponsorships and partnerships are some of the best in Racing, so I have full faith that we can get something done to fill in the season. If anybody is going to do it these guys are. The goal is to absolutely win races and run competitively as we can and be in the top 5 in the points championship heading into Indy definitely the goal. 16th And Georgetown: Last season everything was really put together very late with Vision Racing, and if I remember correctly your seat fitting was the same day that the transporters left for St. Pete. Although the entire 2010 schedule isn't set, you know the team your gonna be with, the month of May is set, your teammates are set, your crew is set. With a full 2-months before the season opener, how much of an advantage do you have over last season just knowing all that stuff is taken care of? Ryan Hunter-Reay: The preparations, I'm going to be able to go testing, which I haven't been able to do. It's night and day difference to be able to prepare, and prepare with a team like Andretti Autosport. It's totally different, definitely the most preparation I've had going into a season and I'm really looking forward to it. 16th And Georgetown: In 2007 you joined on mid season with Rahal/Letterman and had only 1 teammate, then in '08 you were a one car team with RLR. This past season you joined Vision where you had only 1 teammate before switching to the singal car team in A.J. Foyt Racing. Now with Andretti Autosport, How beneficial will it be to have 3 other, very competent, experienced teammates who have all won races? Ryan Hunter-Reay: That's the great thing. I'm really looking forward to having teammates, I really haven't had that in the past. You know, I worked with Ed Carpenter briefly at Vision, but it's something that you cant really put a price on. It's an absolute advantage and to have teammates. First of all Tony Kanaan, multiple race winner and champion of the series and Danica and Marco have both won races. All are very competent and know what there doing, know what they need out of the car and all of us working together, chemistry is going to be a key factor. If we all work together and pull in the right direction there is no reason we cant challenge for wins and get Andretti Autosport back up top where it should be. 16th And Georgetown: In the press release it said that you would run in the Indianapolis 500, and then races both before and after the month. Do you have any idea of which races those are at this point? Ryan Hunter-Reay: Right now it looks like it will be Brazil, St. Pete, I think possibly Long Beach, Indy, Toronto, Homestead and were pretty close to locking up a few more right now. 16th And Georgetown: It'll be the #37 car with a fully branded, IZOD primary sponsorship livery, correct? Ryan Hunter-Reay: Yes, it will be for those races. 16th And Georgetown: How confident are you in putting together a full-time program? Ryan Hunter-Reay: I have full confidence in these guys, it's pretty much out of my hands and it's up to Andretti Autosport to put it together. Should we not have a full-season together going into Brazil, we still have a chance of putting that together once the season starts, it's not the drop dead date, we still have quite a bit of time to pull everything together. If we get on track and do well, that will certainly help. 16th And Georgetown: Last season you got a ton of air time with the IZOD commercial and several weeks ago you joined Marco, Graham , TK, and a few more drivers in Panama to shoot a 2010 IZOD commercial. Can you tell us how that went and maybe give a little bit of a preview? Ryan Hunter-Reay: The commercial is going to be great, when IZOD wants to do something they certainly do it right. PVH is the parent company, Philip-Van Heusen is first and foremost a marketing company, they know how to do it and what to do. When we went down there it was no expense spared to put the right commercial together, it's going to be like no other racing commercial, that's for sure. 16th And Georgetown: IZOD first got on board in 2008 when they became your personal sponsor and IndyCar apparel sponsor. Then obviously this past November they signed on to become the title sponsor. It's got to feel good for a company to grow with you in such a short period of time to invest millions of dollars, over multiple years into the series. Ryan Hunter-Reay: Yea, when the whole thing started I had no idea it would get this big, but it's an honor to be with them and represent them. We've won a race together, Indy 500 rookie of the year, and we've done some great things together and the future is looking real bright for IndyCar with IZOD. For me to be pretty much at the center of that, in that I'm the on track representative it's real special for me. 16th And Georgetown: The Month of May has changed from the old 4 day qualification format to a 2 day setup, the basically just smushed all of the practice days together. What are your thoughts on the new schedule? Ryan Hunter-Reay: I think it'll help the teams out financially, and we'll still get a lot of track time in those dates and the two weeks that were gonna be on track, so they've put more track days per week then it was when it was spread out. We were only on track a portion of the week when it was spread out. All-in-all I think it's going to be great for the show, and I think everybody is behind it. 16th And Georgetown: The next generation IndyCar has been a topic of much conversation over the last couple years, and even more so recently. One option is just an evolution of the current Dallara. Another option is reportedly much more radical. It was apparently first drawn up with 3 wheels, before the FIA shot down that idea, and now it's been compared to a stealth bomber. What do you want to see in the next generation IndyCar? Ryan Hunter-Reay: Well, this can go many different ways, we really don't know if it's going to go in that radical of a direction. What I really want is, I want it to still be an IndyCar. I don't want to lose that IndyCar look, the IndyCar sound, I don't want it to look like some type of special Matchbox Hot Wheels car. I'd rather it look like an IndyCar, that's our identity. You know an IndyCar when you see one, and I would hope we would take a step into the future with a futuristic looking IndyCar. I don't know if I'm completely sold on this stealth bomber looking thing. UPDATE: It appears that Z-Line is leaving with Justin Wilson for Dreyer & Reinbold Racing. In an IndyCar teleconference, Dale Coyne says that driver announcements will be made at the end of the month. It did sounds like DCR will run 2 cars in 2010. Z-Line Designs will remain on the #18, and Boy Scouts of America will find it's self on the #19. Dale Coyne: "The driver announcements will be coming out at the end of the month"
Bob Jenkins: "An "s" on announcements, so maybe more than 1 car?" Dale Coyne: "Your just like everybody else, your very observant. Yea, I did say "s" on that, plural. Z-Line has been a great sponsor over the past 2 years and they plan to continue in 2010. For those savvy reporters out there, you probably figured out that the Boy Scout car is now #19, which leaves the #18 car open for a second car which has traditionally been the Z-Line number." HVM Racing would like to see your designs for the next generation Indycar. The team has opened up an online forum for fans to submit their designs, and add comments and criticisms. One submission, selected by a random drawing from all submissions, will win the opportunity for two people to be VIP guests of HVM Racing at the 2010 Indianapolis 500. Huge props go out to HVM Racing for coming up with an innovative way to get fans involved in such a crucial decision for the future of American Open-Wheel Racing. 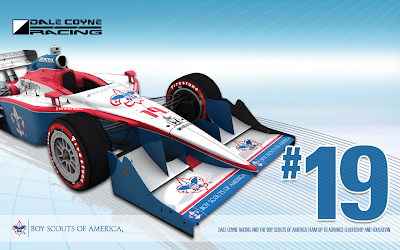 In what could be a spectacular marketing opportunity, Dale Coyne Racing will run the #19 Boy Scouts of America Dallara in all 17 races on the 2010 IZOD IndyCar Series schedule. The agreement coincides with the 100 year anniversary of BSA. For most of 2009 DCR ran the #18, so it's unclear if this will be a 1-car team or if they'll return to their 2008 2-car program. According to Boy Scouts of America "This is a multiyear program and will continue well past the 100th Anniversary Celebration of the Boy Scouts of America". More information on the agreement may come out around 3pm est when DCR and BSA hold a conference call, stay tuned. Q&A With Arie Luyendyk Jr.
16thAndGeorgetown: In a recent Q&A with Jonathan Byrd II, he mentioned that one of his favorite racing memories growing up was in 1996 when your father broke the speed record at the Indianapolis Motor Speedway for his dads team. With a father that has one 2 Indianapolis 500's among many other accolades, what are some of your favorite racing memories? Arie Luyendyk Jr.: Life obviously changed a lot after the 1990 Indy victory but the years between 1996 and 1999 really stand out. He seemed unstoppable at Indy and had a chance to win every year. He had a lot of back luck but in '97 it all came together. I think I was at the age where I could really appreciate how talented he was and I was on the path to my career so those years really left an impression. 16thAnGeorgetown: Can you tell us a little bit about Anti-Celeb, the clothing company that your involved with? 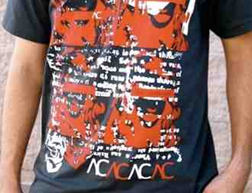 Arie Luyendyk Jr.: It's a start up clothing line me and my two friends debuted last year. I've always liked the fashion industry and thought it would be fun to start a small clothing company. Every month we grow a little bit but the main focus has to be racing so a lot of my attention has been on my plans for 2010. Anti-Celeb is the counter culture to the main stream gossip that fills our news these days...basically we promote individualism. 16thandGeorgetown: By far and away you hold the F IL record for most starts with 62. Unfortunately you went the first 61 races without a win, but that all changed in September of 2008. At Chicagoland Speedway your teammate, Raphael Matos finished 3rd and secured the championship, while you took the AFS/AGR car to victory lane for your first win. How did it feel to finally get that monkey off your back? Arie Luyendyk Jr.: Honestly it did bother me the first few years in Indy Lights. In 2002 I finished second 4 out of 7 races so the competitiveness was there, but luck was definitely not on my side. Throughout my career I have been up front so it was always on my mind and I think that made it even more frustrating. In 2008 I really came with a different mindset and poured through data and really worked with Rafa and AGR, I think I've matured since those first few seasons and ultimately that led to my success. I think the potential was there in 2008 to win more races but I'm happy with how it turned out regardless. 16thAndGeorgetown: In 2009 you joined Mike King in the VERSUS booth for the Firestone Indy Lights broadcast. Was it difficult sitting on the sidelines watching the series that you've competed in since 2002? Arie Luyendyk Jr.: Yes and no. I feel like there is always room for improvement but after the 4 full s easons running Indy Lights I have maximized what I can learn and I was ready to move to IndyCars. When funding wasn't available I turned to Versus and IMS Productions and I have to say it was a really positive experience. Mike King is great to work with and I really enjoyed calling the races with him. That being said it was still difficult not to jump in a car. Panther's driver Pippa Mann was sick in Kentucky and if it had not rained out on race day I would have subbed in, so I was close to making a start in '09. 16thandGeorgetown: Without turning a lap in 2009, I'm sure the season didn't turn out the way you would of liked. Is there anything in the FIL or IRL pipeline for 2010 and if not is a return to the VERSUS booth possible? Arie Luyendyk Jr.: Unfortunately Versus won't be airing a full race show for Indy Lights in 2010 but I will take that experience with me and hopefully get back to the booth in the future. As for next season things are looking good for a return to Indy and possibly the event before in Kansas. I have aligned myself with a new management company, Top Speed Management and things are looking positive for 2010. 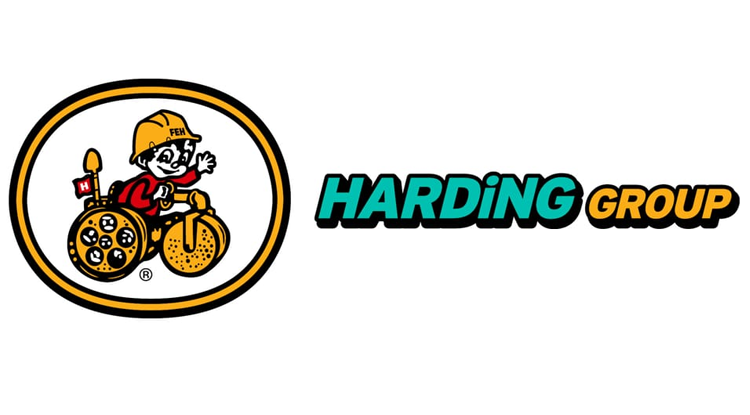 16thAndGeorgetown: Since the end of the season you've spent the off time racing karts. How has it gone and have you enjoyed getting back to your racing roots? Arie Luyendyk Jr.: Karting is such a great sport and I have enjoyed running a lot of local races in the Phoenix area. It's hard to explain to someone that doesn't follow the karting scene but it has to be most raw talent driven side of racing. The physical side of it helps a lot when it comes to driving the bigger cars, I've always been a huge fan of karting. 16thAndGeorgetown: The Month of May 2005 seemed to be one of extreme ups and downs for both yourself and the team. After first qualifying for what would of been your inaugural "500", a controversial last minute entry bumped you from the field. Do you use that experience as motivation or do you just try to block it it? 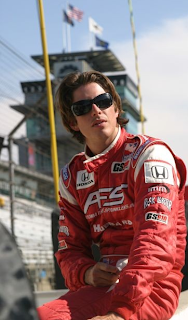 Arie Luyendyk Jr.: No I don't block it out, it was a bad experience and I feel like I performed as well as any other driver could have in that car and that situation. It was rushed and not done properly, I learned a lot through that experience and the one lesson I took from it was that not just any ride will do, sometimes as a driver you have to make hard decisions for your career and now I try and align myself with good equipment. My move to drive for AGR in Indy Lights is a perfect example of this. 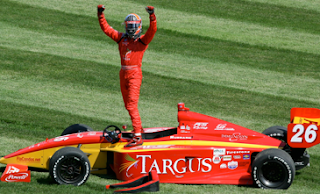 16thAndGeorgetown: Redeeming yourself in 2006, you qualified the #61 Panoz/Honda for your first Indianapolis 500. With the start you and your father joined a list that includes Michael & Mario Andretti, Gary & Tony Bettenhausen, and Al Unser Jr. & Sr. as a father a son combination to drive in the race. What did it mean to you to make the Greatest Spectacle in Racing? Arie Luyendyk Jr.: It's every bit as big as everyone says and I feel honored to have been a part of that field of 33. We ran the '06 Indy on a tiny budget and it was completely spontaneous because we starting planning to run the race just a few weeks prior to opening weekend. So many people made that ride possible and it was a great feeling to make it into the show after the drama in '05. I think I proved I have what it takes to qualify on a low budget, but now my goal is to show everyone I can run up front if given the right chance. I feel like I have some unfinished business at the speedway. 16thAndGeorgetown: Both the IZOD IndyCar Series and Firestone Indy Lights schedules have changed a lot over the last couple years. What do you think of the 2010 schedule and in a perfect world, what would you like the ratio of Ovals, Road, and Street circuits to be? Arie Luyendyk Jr.: The schedule looks great to me but I will say from a fan prospective the oval racing is the most entertaining. Drivers love the challenge of different circuits and I would love the schedule to be half oval and half road/street courses. I think then you can keep the championship diverse but still retain the excitement that comes from passing which the ovals provide more of. I've gotta give a huge thanks to Arie, and be sure to check out Anti-Celeb on the web. And while your at it follow him on twitter and facebook. 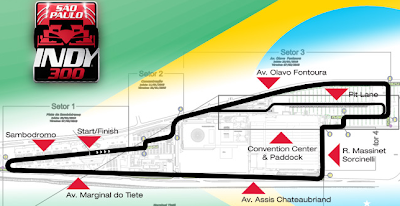 After weeks of speculation the Sao Paulo IndyCar GP track layout (seen above) is set to be announced over the next week, possibly next Tuesday, January 12th. The track is roughly 2.2 miles and will run clockwise. The inaugural Brazil GP is set to lead off the 2010 IZOD IndyCar on March 14th, and the 2 sides are reportedly in talks to extend the agreement through 2014. Andretti Autosport has signed Ryan Hunter-Reay to a yet to be determined number of events in 2010. Ryan will pilot the #37 IZOD entry for Andretti in the '10 Indianapolis 500 and "key series events before and after the month of May". Andretti Autosport, Ryan Hunter-Reay, and IZOD are still working on putting together a full-season program. "Joining a team of Andretti Autosport's caliber has been my goal for the entire 16 years of my racing career and being able to strengthen my ties to everyone at IZOD through this effort is tremendous. This is the opportunity of a lifetime and I am ready to give 120 percent to the program. "I have never met a group of people who are more determined to win races, and especially the Indianapolis 500, than the people I am working with at Andretti Autosport. When the folks around you share the same enthusiasm and determination you do the prospect for success is high, which is why, Andretti Autosport is one of the winningest teams in IZOD IndyCar Series history. Now that the decade has come to an end, the top drivers of the past 10 years are up for debate. 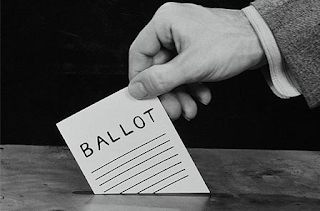 In a recent post by Tony Donohue he expressed his opinion, and now it's your turn. Select your top 10 American Open-Wheel drivers of the decade and the results will be unveiled in an upcoming Planet-IRL podcast, featuring Paul, Kohl and yours truly.